August 1939. "The Derrick, roadhouse in Oklahoma City oil field." Medium format negative by Russell Lee for the Farm Security Administration. View full size. Submitted by kcars88 on Fri, 06/01/2018 - 12:03pm. Those cheap sandwich prices are deceiving. In 1939 a gallon of gas was about 10 cents. So I don't think much has changed as far as prices go. Submitted by Jeb70 on Thu, 05/31/2018 - 5:36pm. I wonder how many fights broke out among the oilfield workers in this place so close to the oilfield? It looks like a nice place and I am sure they tried to keep it that way but what happens when drillers from different companies and alcohol get mixed? I can only imagine. Submitted by Doubleclutchin on Thu, 05/31/2018 - 8:08am. 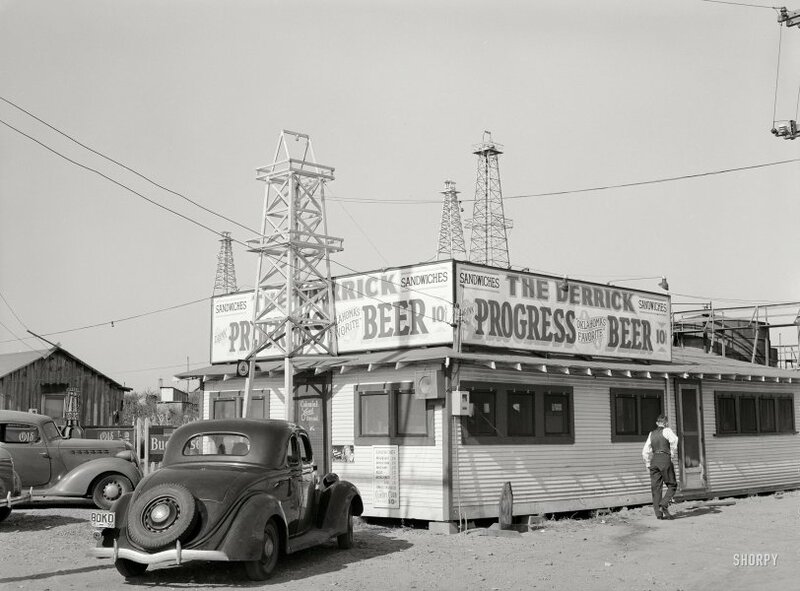 Busy oilfields, cool 1930s cars (Hudson, Chevy, and Ford visible here), and 15-cent sandwiches. Maybe the Depression wasn't all bad! Submitted by Hayslip on Thu, 05/31/2018 - 7:26am.